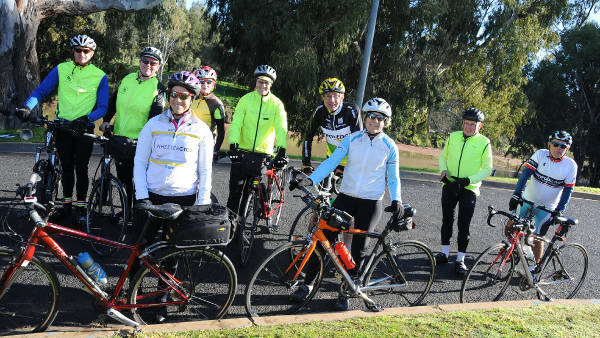 Dubbo Bicycle User Group (BUG) was started in May 2005 with the aim of encouraging people to get out and go for a bike ride. It was formed for people who hadn’t ridden before, or were looking to get back into riding. Over the last two years, more bicycles than cars have been sold each year, so Dubbo BUG is looking to encourage those new bike owners to get out and ride their bikes. In this age of fast food, diabetes and obesity, bike riding is a good way of improving your health by doing some exercise, without impact on your body. Riding in a group is also safe way of being on the road on your bike. There is always someone to help if you get a flat tyre, to encourage you if you are feeling a bit tired, and, if you are in a group, the magpies are usually too scared to attack! Maybe you need help to get your bike seat the correct height, pump your tyres to the correct pressure, or want to learn how to fix a puncture. A lot of people new to riding also tend to be set up incorrectly on their bike and don’t use an efficient pedalling technique. Dubbo BUG is happy to help you in any of these areas. Joining a group is also a good way to get to know people if you are new to town, or to make new friends and get some exercise at the same time. Dubbo BUG meets every Sunday morning at 9.00am during winter, and 8.00am in the summer, at Wahroonga Park in Healy Street, South Dubbo for a social bike ride, followed by an even more social morning coffee. All you need to take part is a roadworthy bike and a bike helmet. It doesn’t matter how fast or slow you ride, there will be someone to keep you company.